Sanitation Collection is performed daily by the Borough of Hellertown by Zones. Additional charges will apply per the current fee schedule. Paint Cans – Latex paint is accepted. Please air dry can before placing in trash. Kitty litter or sand will soak up excess paint. OIL BASED PAINT CANNOT BE ACCEPTED. Watch the Borough’s Facebook page for paint recycling events. Walk Behind Mowers – All gasoline and oil must be removed and recycled prior to the collection of this equipment. Drop off Electronic Equipment and Universal Waste at any AERC Location Fridays from 9AM – 4PM. The Pennsylvania Department of Environmental Protection is advising consumers and businesses of new rules for recycling electronic devices that took effect on Jan. 24, 2013. Enacted in 2010, the Pennsylvania Covered Device Recycling Act prohibits the disposal of covered devices (such as computers, laptops, monitors and televisions) with residential trash. Trash haulers will be barred from taking those items, except in municipalities with a designated curbside electronics collection program that results in the devices going to an electronics recycler. Many devices also contain valuable metals such as gold, silver and platinum and base metals like copper, iron and aluminum that can be separated and reused in new products. The law also requires manufacturers of devices to provide for the collection, transportation and recycling of these devices by establishing one-day events, permanent collection programs or mail-back programs. 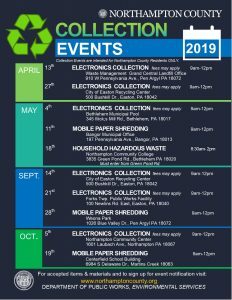 Visit the Borough’s Facebook page for announcements of local E-cycling events. More information on the covered device recycling act is available at www.dep.state.pa.us, keyword: Electronics Recycling. Recycling is Easy and Required by Law! 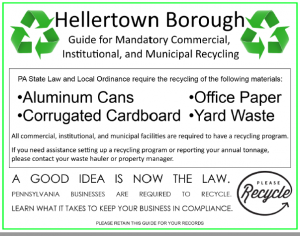 J.P. Mascaro collects recyclables for Hellertown Borough residents. Please see the schedule for your recycling day posted under Recycling Schedule. If you need a recycling bin, please contact the Borough office at 610-838-7041. There is a $10 charge for a recycling container. Or you may purchase your own container and obtain a “recycling” sticker from the Borough office.